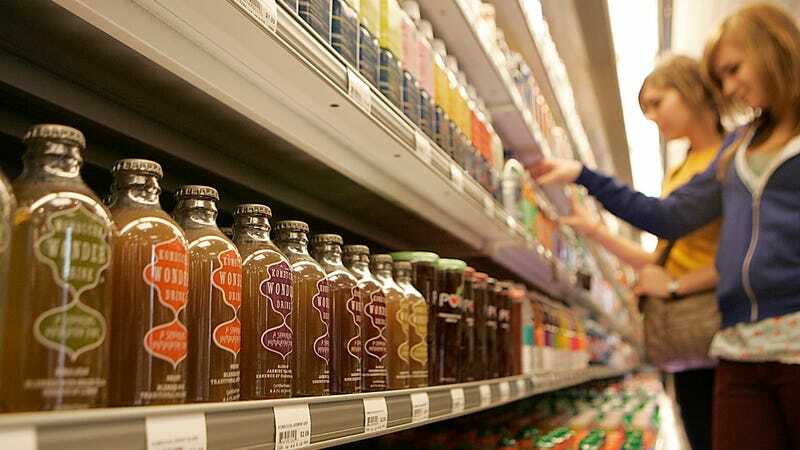 Until someone—me—points it out, you might not have realized that pretty much every kombucha on stores shelves is in bottles. Weird, right? We have canned wine, canned cocktails, canned cold-brew coffee... why not canned kombucha? Finally, that’s changing. News of Brew Dr. Kombucha’s national launch into cans calls it “the first kombucha brand to offer its products in cans.” That’s not exactly the full story, as Washington state-based Kombucha Town, California’s Kombucha Wonder Drink, and even Trader Joe’s have previously canned their kombucha. But Brew Dr.’s coast-to-coast availability at grocery chains like Whole Foods make it perhaps the most visible canned kombucha. Even the smaller guys like Kombucha Town only started canning their fermented tea beverage within the past couple years. I’d argue that mindset is outdated. Thanks to the efforts of craft brewers and coffee roasters, consumers now know that great-tasting beer (and wine, and cider, and coffee) can come from a can. In fact, cans are more portable, recyclable, and crushable than bottles, which is why I’m stoked to see kombucha finally get the aluminum treatment. The only downside is that you can’t reseal a can, so you’ll have to wait until you can commit to 12 ounces of fermented tea at once.